Mixing Valves will protect you from cold and scalding water. These handy valves mix cold and hot water to deliver the optimal water temperature. Canarsee carries a range of quality Mixing Valves from Webstone that'll suit your residential plumbing needs. The 74102W from Webstone Valves is a 1/2” Union Male Threaded Mixing Valve, Lead-Free (95F-131F.) .. The 75102W from Webstone Valves is a 1/2” Union Sweat Mixing Valve, Lead-Free (95F-131F). .. The 74103W from Webstone Valves is a 3/4” Union Male Threaded Mixing Valve, Lead-Free (95F-131F.) .. 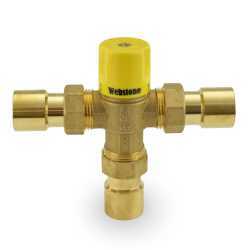 The 75103W from Webstone Valves is a 3/4” Union Sweat Mixing Valve, Lead-Free (95F-131F.)Featu.. The 78103W from Webstone Valves is a 3/4” Union Press Mixing Valve, Lead-Free (95F-131F.)Featu.. Features: 1" Union Sweat Mixing Valve (Lead-Free), 95-131F; Union connec.. The 74104W from Webstone Valves is a 1” Union Male Threaded Mixing Valve, Lead-Free (95F-131F.).. The 78104W from Webstone Valves is a 1” Union Press Mixing Valve, Lead-Free (95F-131F. )Feature..